I own several Dietz bikinis, but this is the first thong I purchased from them. This is mainly due to them just starting offering more thongs. The first thong I’ve seen of theirs before the Firenze line is the Komfort Moon thong. I’m not a fan of the pouch shape on it, so was happy they introduced a traditional cut thong with the Firenze line. They now have the Firenze and the Firenze Sec line. Fabric content is the difference between them. To compare the fabric lines I got a bikini in the Firenze line and you can read that review here. The Firenze line is a light weight and you could say semi sheer since it is a thin fabric. It’s a blend of 92% viscose and 8% spandex. The Firenze Sec line is a blend of 91% polyester and 9% spandex. To me the Firenze Sec line has a cotton look to it even though it isn’t. Now like other pairs of theirs I reviewed I like the subtle accents they do. On this one, it is the color accent they add to the waist. I like the cut of the thong back off these. It’s a nice streamlined look. Love how the back looks on me. The pouch is centered seamed, so has contouring. Also the pouch has an added layer of fabric. The thong provides excellent support. The Dietz name and logo are on the left pouch panel. 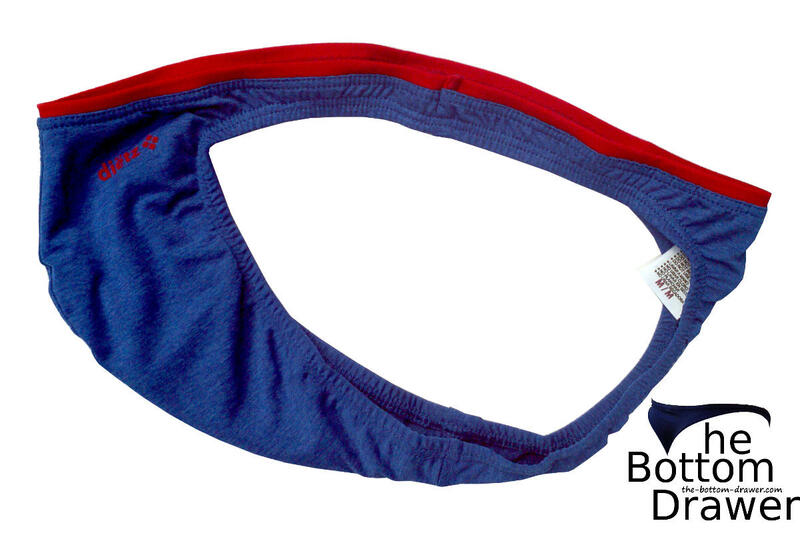 The sides of the thong are about 1″ and the tail is also about 1″. The thong’s care instructions say to hand wash and hang dry. I’m not 100% sure of the comfort of the tail. Sometimes it can be bothersome a bit and then soon after it is comfortable. Strange thing is nothing really changed between the comfort change. It is a thong that let’s you know you have a thong on. The majority of the time the thong is comfortable, but for some reason now and then it can bother me. It doesn’t make me want to take them off and put on another pair of underwear though. They are a little snug fitting, so maybe that has something to do with it. Nothing is standing out to me on why. I still think they’re a pretty nice thong. I’d like to try the first Firenze line with the softer, lighter fabric. I’m still giving this pair one thong up, since I think it is worth a try. Pros: Sleek looking back cut. Good support. Cons: Typically you notice you have a thong on and at times can annoy you. Double lined pouch. What do you rate the Dietz Firenze Sec Thong? Looks comfortable and style is nice. I would usually wear something with even less fabric. Joe Snyder or Daniel Alexander tanga. I like my under wear to cover the front and back but barely just at the begining of the privates.No more but be less. I guess that’s why I wear the same brands. Thanks BD. Just got mine in the mail and I must say your review is spot on. The tail hasn’t bothered me yet but I do like the support. As you say, it does make you know, “you are wearing a thong”. Sometimes I like that though. It’s perfect for the gym since just like you I’m not a jock guy. Definitely thinking about purchasing more. Glad to hear the thong worked out for you. I agree that a thong that reminds you that you are wearing one isn’t a bad thing as long as it is comfortable. Thanks for the feedback.